When it comes to ways of organizing chores for your children, there is no one right or wrong way to do it. And there isn’t a best way to do it. In fact, I think a good idea is to mix things up. New ideas bring on novelty, and novelty makes things exciting. Work does not need to be boring to be effective :). I have shared chore charts and chore cards with you. Next up is chore jars. It is very simple. You put pictures of chores on cards and then put them in some sort of a jar. If you don’t have a jar, the dollar store sells jars. Now for more details on the process. First, pictures. How do you get the pictures and how do you get them on cards? And why pictures? Well, why pictures is for the benefit of the child who cannot yet read. Where do you get the pictures? One of two ways. then print it out. I printed mine on card stock. You could also laminate them if desired. follow as above from step four. You could also just print the photo and write on the back. 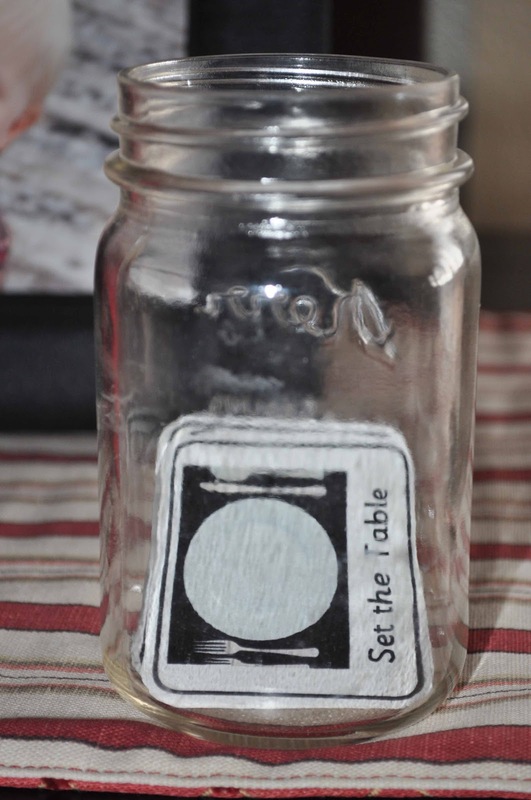 You could use chore jars for your daily chores if you want to. I use it more at random. We have certain chores on certain days (for example, we clean the bathrooms on Thursday). But the chore jars are great for the random chore or if we are getting into a rut about the chores.